Located within walking distance of the Cornish river Lynher near Saltash and set in a designated area of natural beauty, Notter Mill is the perfect place to explore and holiday in the relatively untouched south east of Cornwall and western Devon. Be more active on your holiday at Notter Mill and enjoy the Cornwall sunshine in our outdoor heated swimming pool. On your holiday you can indulge in a game of tennis or even enjoy the Cornwall wildlife in our conservation area. 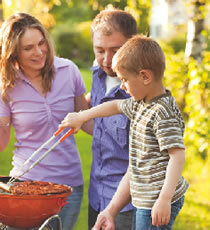 Children can run wild on our extensive playing field and well maintained Play area. During the summer holiday months there is a badminton net available for all to use. Notter Mill is an award winning Holiday Park in Cornwall winning 12 consecutive Bellamy gold awards for conservation. Our Superb Dutch built self-catering cottages lay quietly within a sheltered woodland valley where you can holiday and relax in a private hot tub, immerse yourself in the surrounding beauty or just soak up the local culture. 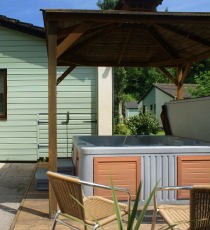 Our self-catering cottages are suitable for all types whether you want extra luxury in a hot tub, pet friendly self-catering cottages, family holidays, wheelchair-friendly self-catering cottages or a couples holidays, Notter Mill is the perfect holiday destination for you to enjoy Cornwall and recharge. Wonderful, peaceful location. Hot tub amazing, nice touches to make you welcome. Lovely weather and well rested, thank you.